You've wasted enough expensive ingredients making substandard solid bubble bath bars with problematic recipes, right? You've dropped enough dough on overpriced retail bars that stain the tub & dry your skin too. No more! Other recipes dry so fast you don't have time to be creative. You do not want to be rushed if you want a full range of shaping options. You also don't want the recipes that stay tacky forever & never fully dry. Solid bubble bath bars that are too soft will smash in shipping & won't survive handling in shops. These bars are the perfect consistency. You will have time to play with the dough, but you won't have to wait weeks (or forever) for them to dry. They take 2-3 days to dry on average. They also bubble like mad in the tub with a long lasting bubble. These are the Ultimate DIY Solid Bubbly Bath Bar! In just days, you can enjoy your creations in your own tub. 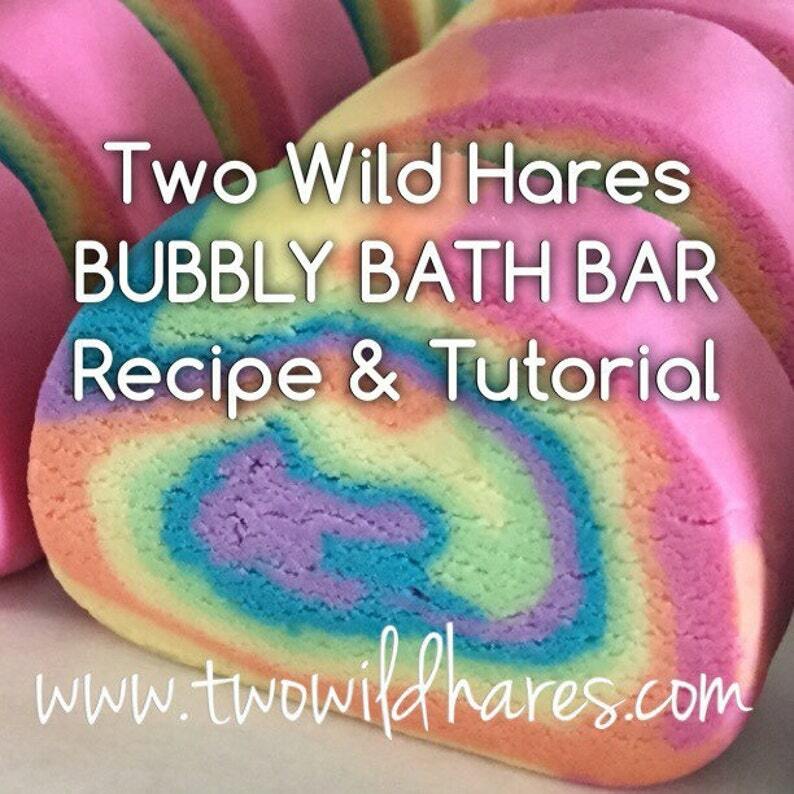 The Ultimate DIY Bubbly Bath Bar recipe is the price of only 3 retail bars, on average. You will recoup the cost of this recipe making only one batch. Most people's first batch are beautiful the first time because this recipe is so easy to make. SHARE your creations! Share your results with me at twhsoap [!at] gmail.com. I appreciate those who've told other soapers and shared on FB groups as well. Thank you, thank you! Your shares on social media are very appreciated. Message me if you need help or have any questions. I am happy to help you succeed at making these. I troubleshoot any problems with any customer, any time. DISCLAIMER: All of Two Wild Hares recipes are made, used & sold at your own risk. Have product insurance in place and look up IFRA max usage rates for fragrances before using any fragrances. Please educate yourself in safe cosmetic making practices including sanitization, proper preservation, handling, packaging & shelf life before making & selling any bath & body products. Spring has sprung! Enjoy 10% off select items. Happy Spring! Fantastic! Easy, great recipe and I tried them all before purchasing this (spending about $120 on 6 failed batches that would never harden). I don’t know about you guys, but I don’t have 14 days to spare waiting on a bubble bar. If you’re on the fence because you’re trying to be smart with money, the recipe is a great investment. Works awsome on bubbles, feels luxurious with cocoa butter in it, skin nice and moisturized. Had 1 try go darker as dried than the other times. Maybe fragrance oil?